Over the past couple of months since the release of 3DM's Kairos Quest, I've had some questions about what exactly it covers. What is the scope and sequence? How is the curriculum organized? How do the units fit together? To answer some of those questions, here's an inside peek at each unit. If you just want a general overview of the curriculum, click here to see a previous post. Otherwise, read on. Kairos Quest is a 39 week large group/small group elementary age curriculum that spans a single school year. The 39 lessons are divided into nine different units of teaching. Unit Focus: Learning how to hear from God and do what He says. 3DM Content: Lifeshapes - the learning circle. There is an amazing God working behind the scenes of our everyday lives. While our lives may seem ordinary and boring, this God is just waiting to break into our day and take us on adventure. Like any good quest, there's plenty of excitement and danger along the way, an enemy to outwit and mysteries to solve. In this adventure-themed series kids will learn how to pay attention to those kairos moments, when God gets their attention and invites them to join His epic quest. In Circle Up, kids will use the Life Shape of the Learning Circle to discover how to hear from God and act on what He tells them. Unit Focus: Imitating the life of Jesus. 3DM Content: Lifeshapes – the triangle, the semi-circle and the pentagon. We all have heroes we look up to in life, and it’s only natural that we want to be just like them. In this superhero-themed unit, kids will discover that Jesus is the ultimate hero, and we can become more like Him by doing the things He did. Each week in this Hero Worship series we're going to look at one part of our hero Jesus' life so that we can copy it and experience more of Jesus in our everyday lives. We will spend the first three weeks of this unit working on the Life Shape of the Triangle and will see how Jesus had perfectly balanced relationships of Up, In and Out. Next, we’ll spend a week on the Semi-Circle which will help us discover how Jesus worked from a healthy place of rest, and finally, we’ll check out the ultimate super-hero team, the church and how each of us can play our own special part. Unit Focus: Praying like Jesus. Life is hard – especially when you’re trying to follow Jesus. Sometimes it’s hard to forgive people when they’re mean to us, or it’s hard to do what’s right when all of your friends are doing what’s wrong. It’s hard when you have to face a bully or a big test. It’s hard when people we love get divorced or get sick. But when we learn to pray like Jesus did, suddenly we have the chance to plug into God’s power, and God’s power can help us do anything that God wants us to do. In this sports-themed unit, kids will learn about the Lord’s Prayer, the model Jesus gave them to coach them in the art of prayer. Kids will learn six big prayer skills laid out by the ultimate prayer coach, Jesus himself. Kids will discover how praying about God’s character, kingdom, provision, forgiveness, guidance and protection will turn them into prayer all-stars who will change the world..
Unit Focus: Exploring what the Christmas story teaches us about responding to God’s activity in our lives. Every kid wants to have the biggest, best Christmas ever. In this holiday themed unit, kids will discover that having the biggest Christmas isn’t about the number of gifts they receive, the cookies they’ll eat or the decorations on their trees. The biggest, best Christmas is a kairos Christmas, a Christmas where kids learn to recognize God’s activity in their everyday lives and make the decision to do something about it. Christmas reminds us that God loves to break into the world of ordinary people just like us. From Mary and Joseph to the shepherds and the wise men, this series will take a look at the major players of the Christmas story and how they responded when God showed up in some surprising ways. Unit Focus: Introducing kids to the big story of the Bible and the big themes of relationship and responsibility using stories from Genesis. Launch is a space-themed unit that begins our journey through the big story of the Bible, the story of Covenant and Kingdom. In Launch kids will see how God launched all of creation into existence and wove the threads of relationship and responsibility throughout Scripture. Kids will discover how God’s perfect world fell into sin but how God launched a new covenant with Abraham and kingdom breakthrough with Joseph. In this first Covenant and Kingdom unit, kids will begin exploring key Old Testament stories from Genesis that will help them understand the big picture of relationship and responsibility from the Bible. Unit Focus: Old Testament examples of God’s faithfulness to His people in the midst of sticky situations. Some days it seems like life is an endless series of sticky situations, facing those problems and challenges that don’t always have easy answers. In this sticky-themed unit, kids will discover that no matter what sticky situation they find themselves in, God is much stickier. Kids will see that God is a faithful covenant partner who sticks by their side no matter what. In this second Covenant and Kingdom unit, kids will continue exploring key Old Testament stories that will help them understand the big picture of relationship and responsibility from the Bible. Unit Focus: Discovering who Jesus is and what it means to follow Him. Everyone loves a good mystery – investigating the evidence, gathering clues and finally discovering the answer they’ve been looking for all along. In this detective-themed series kids will meet the original Mystery Man, Jesus, who holds the answers to life’s greatest problems. In Jesus the great mystery of God’s love is revealed at last. The Mystery Man unit is all about knowing Jesus and following Him. Over the next four weeks kids will pick up their magnifying glasses and begin their investigation of the first great stories from the New Testament, the life and early ministry of Jesus. In Mystery Man, kids will discover why Jesus came to earth and how He restored our covenant and kingdom with God. They will see how Jesus beat temptation in the desert by remembering what God had said about Him, and they will learn what it means to follow Jesus and share Him with the people of peace God sends their way. Unit Focus: Exploring Jesus’ miracles and what they tell us about heaven. Snapshot is all about the pictures of heaven Jesus gave us through His amazing miracles. In Snapshot, we use a photography theme to talk about how Jesus gave us snapshots of heaven through the incredible things He did. In heaven there is no sickness, so Jesus healed the sick. In heaven, there is no hunger so Jesus fed the crowds. In heaven there is no death, so Jesus raised the dead. In heaven there is no sin, so Jesus forgave sinners and gave them the power to live a new life. In this Covenant and Kingdom unit, kids will get a sneak peak of heaven and discover how God wants to use them to bring the kingdom to earth! Unit Focus: Discovering how the early church imitated the life of Jesus. In Copy Cats, kids will learn how the early church imitated Jesus, the Lion of Judah. Unlike the gospel stories, the disciples in the book of Acts no longer had Jesus in the flesh to watch and copy. Now they had to learn to listen to God and rely on the Holy Spirit to help them to imitate the life of Jesus, just like 21st century kids. Throughout this unit kids will revisit the principles of the Triangle (Up, In and Out), and see how the early church put them into practice. Kids will discover how these three sets of relationships will help them become more the Lion every single day. 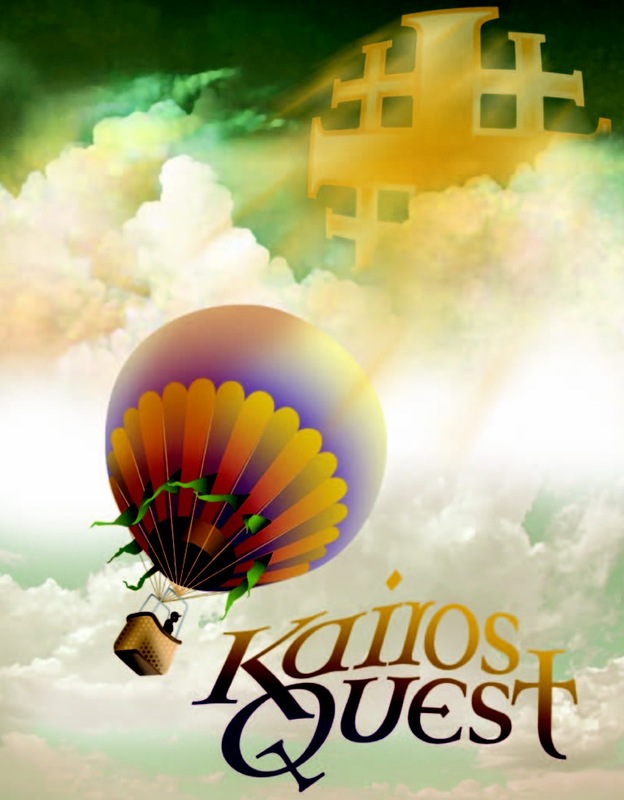 To download a sample of Kairos Quest, here's a link to the free sample in the 3DM Store. For the full 39 weeks of curriculum, here's the link to purchase it on the Kairos Quest product page.